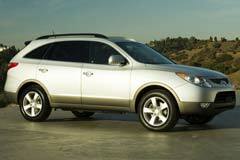 The Hyundai Veracruz is a 7-seat crossover SUV that was manufactured from 2007 to 2012. The car's engine is a 260 horsepower 3.8L V6 that comes with 6-speed automatic, standard front-wheel drive and the option of all-wheel drive. Overall, the Veracruz is luxurious, well-designed, has many features and provides a quiet drive. The different trim levels available for a Hyundai Veracruz included GLS, SE and Limited. The Veracruz GLS trim incorporated standard features such as a tilt and telescopic adjustable steering wheel, a power drive seat, air conditioning, 17 inch wheels, heated side mirrors, heated front seats, six speaker audio system, satellite radio, bluetooth and a sunroof. SE trims provided similar features, as well as the option of leather upholstery, a premium audio system, and a power lift gate. Trim features for Veracruz Limited included standard features and also trim options of a power front passenger seat, climate control, navigation system and surround sound. Veracruz models from 2007 to 2012 are mostly similar, with only minor changes throughout the years. The 2008 model introduced a power lift gate and navigation system options, the 2009 to 2010 models offered backseat DVD entertainment. The SE trim was no longer available beginning in 2009. 2011 Hyundai Veracruz Limited 2011 Hyundai Veracruz, Stone White with 90084 Miles available now! 2008 Hyundai Veracruz LIMITED / AWD / 3RD ROW LIMITED / AWD / 3RD ROW SUPER SHARP (( LIMITED..AWD..3RD SEAT..LEATHER..MNROOF..